Mulberry Endura™ 2-Gang Standard size unbreakable combination wallplate in white color, has rugged thermoplastic construction for longer service life. It measures 4.562-Inch x 4.5-Inch. Wallplate withstand several times more impact, torque and load deflection. 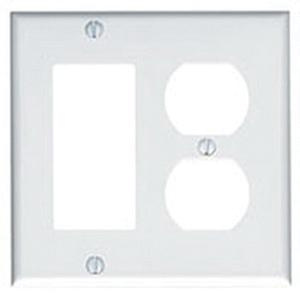 Square GFI-surge combination wallplate has horizontal orientation and employs one block duplex receptacle as well as one duplex receptacle configuration. It incorporates flexible design to fit over uneven wall surfaces. Combination wallplate is great for hospitals, schools and other institutional facilities. It comes with matching metal screws for easy installation. Wallplate is UL listed, CSA certified and meets NEC standards.